One of the books I’ve been reading lately is Steven Pinker’s massive door-stopper The Better Angels of Our Nature. Incidentally, I found it a very interesting read with tons of cool factoids, although it could have done with a third of its text and a tiny fraction of its liberal sanctimonious. 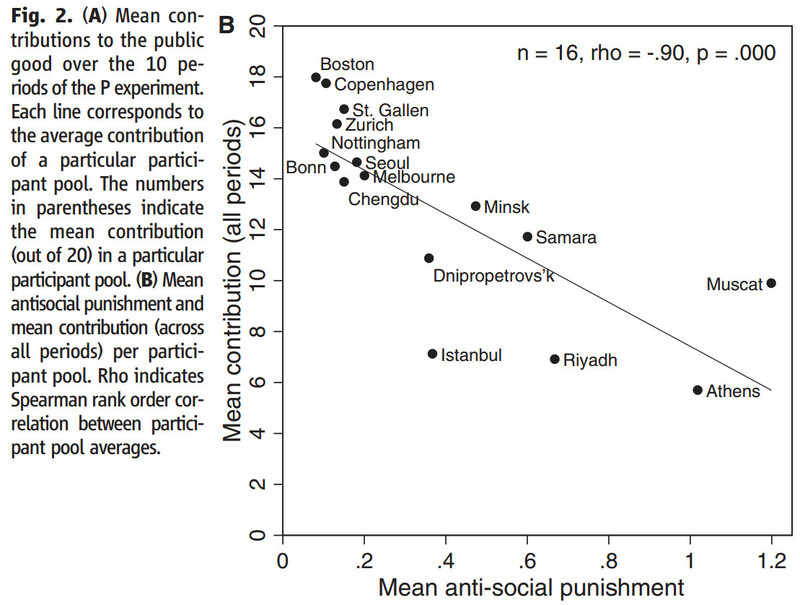 But that’s for the forthcoming review; in this post, I will focus instead on a reference I found there to a very fascinating and revealing paper about Antisocial Punishment Across Cultures (Herrmann et al.) – and by extension, its implications for social cohesion. Power summary: The shrinks got a bunch of university students, divided them into teams of four, and got them to play a “public goods game.” They were given 20 tokens at the start of each of ten rounds, and they were told they could invest any number of them into a pot, with a return of 0.4 tokens to each player – regardless of whether or not he participates – to each token invested in the pot. So if everyone was to contribute all 20 of their tokens, each player would walk away with 32 tokens; on the other hand, if only two players were to contribute all their tokens while the other two got a free ride, the altruists would walk away with only 16 tokens, whereas the free riders would get their 16 tokens plus their original 20 which they had kept back. In this version of the game, there were no interesting patterns; across all cultures, contributions plummeted as free riders enjoying impunity undermined the morale of productive contributors. However, that’s not how the game works in real societies, which actively punish many forms of free riding: Tax evasion, benefit fraud, dodging fares on public transport, etc. The game was then modified to include a punishment option, in which any player could choose to spend one token to remove three tokens from any other player of his choosing. The results changed drastically. With the added option of punishment, some societies become very successful and universally wealthy, while others don’t get their act together and remain very poor. In short, the Anglo-Saxons and Confucians start off cautious, but quickly come to trust each other and devote most of their tokens to the common pot; the students of Protestant Northern Europe trust each other from the very start. But the Orthodox Slavic nations remain cautious and suspicious throughout, on average investing only slightly more than half of their tokens; while the Arabs, the Greeks, and the Turks on average invest less than half their tokens per round and don’t come to trust each other either. Below is a graph of the two experiments side by side: The no-punishment version is on the left, the punishment version is on the right. Why these marked and clearly discernible cross-cultural differences? 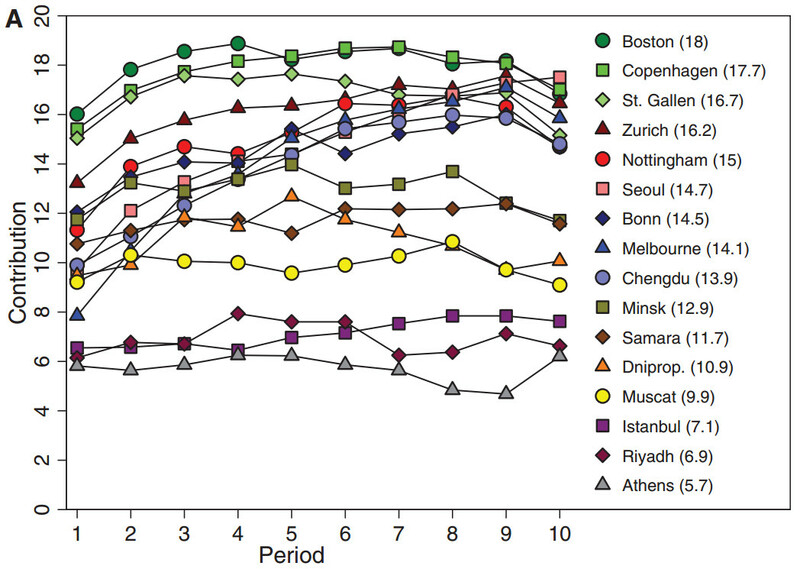 The paper’s authors make a convincing case that it is because the students from Russia, Belarus, Ukraine, Turkey, Greece, Oman, and Saudi Arabia engage in widespread “antisocial punishment.” In a Western or Confucian country, the free riders are punished and shamed into forking out more; in stark contrast, the free riders from the Orthodox, Mediterranean, and Arab cultures are not so much shamed as enraged by being punished for their parasitism – and lash out in consequent rounds against their “do-gooder” tormentors! 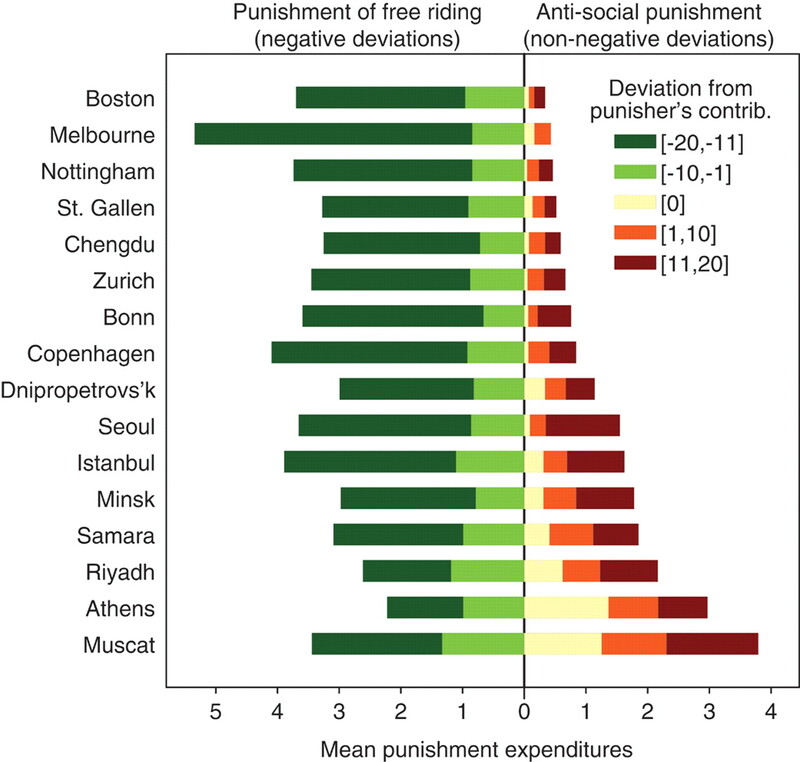 Remarkably, in Athens and Muscat, there was actually more punishment of good, socially-desirable behavior than of parasitic free riders! In a society where the saying “no good deed goes unpunished” is literally true, there is much less of an incentive to do good deeds in the first place. What is regarded as normal, socially-beneficial behavior in some places becomes the mark of a sucker or an idiot elsewhere. 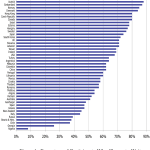 The results of this “do-gooder derogation” are lower cooperation levels and lower overall wealth generation. The article’s authors cite sociological explanations for these variations such as the greater prevalence of rule of law, shunning of revenge, and individualism (i.e. the social qualities that the HBDsphere associates with out-breeding fertility patterns). The Arabs come off very badly. 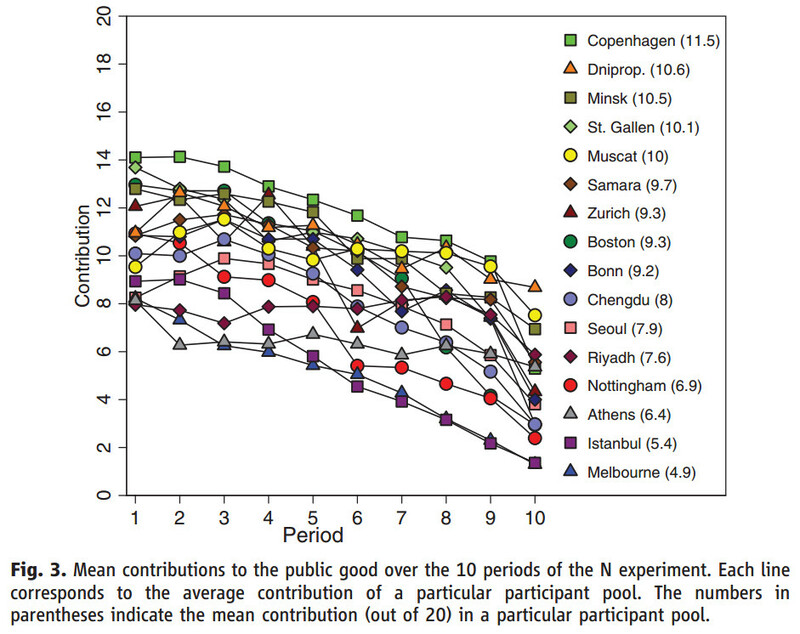 They really do have to drastically cut down on their rates of consanguineous marriage which would, a generation or two down the line, have very positive benefits on both their average IQ’s (currently very low) and their levels of social cohesion (also very low, as seen in these experiments). They would also then be able to stop grasping at radical Islamism as the only political/ideological force capable of transcending narrow familial and clan loyalties that drive so much of the corruption and nepotism in the Arab world. That said the results do throw some spanners into purely HBD interpretations. For instance, hbd* chick tends to be extremely bearish on China, because of its clannish family structures that supposedly cripple social capital in China. 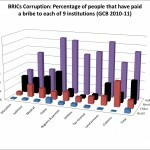 There is plenty of support for this in both anecdotes and corruption stories/rumors, but on the other hand, (1) South Korea despite being heavily influenced historically by China has not only become a rich developed country but also one of the least corrupt in the world; and (2) QUITE SURPRISINGLY, the Chinese (and the Koreans too) learn to trust each other and cooperate among each other just like the Anglo-Saxons in this experiment. Of course even Greece has managed to become a rich country despite the chronic, mind-mindbogglingly high cynicism of its people. Basically, my thesis remains that when it comes to successful development, high IQ >> social capital. Digressions about corruption, nepotism, and the familial structures that give rise to them can be interesting and instructive, but they are quite simply not nearly as import as cross-national/cross-ethnic psychometrics. The results for Russia and the Orthodox Slavic world in general are of course depressing but quite expected. Certainly in my experience Russians are far more suspicious than Westerners and getting any kind of cooperative venture going with them tends to be a fool’s errand. While free riders are occasionally punished, if not with any of the consistency you might expect in the West – when exactly is Luzhkov going to jail? Chubais? Serdyukov? – so are the “do gooders” and whistle-blowers Case in point: Tatyana Ivanovna, a teacher who was dismissed and successfully sued for libel for reporting (credible) allegations of election fraud in St.-Petersburg. It’s not authoritarianism; the story was covered in the Russian media, including the state media for that matter. And the libel case against her was later overturned. What drove the case was the desire for revenge on the part of those she accused of electoral fraud, and the selfish indifference of the fellow teachers who denounced instead of protecting her to advance their own careers. Berezovsky also has a typical Russian mentality (even though he is a Jew). Instead of enjoying his loot in peace, like any respectable thief in the West, he instead beggared himself by waging an irrational vendetta against Putin for his perceived betrayal. Things seem to be similar in Greece. One might think they would appreciate a journalist who gives them information about politicians with Swiss bank accounts; instead they arrest him for violating the privacy of people who are most likely thieves. Of course unlike with Russia, everyone agreed that Greece is at democracy; this is just to make the point that democracy or the lack of it is quite irrelevant to these issues. But maybe not quite. After all, if the general mass of the population is useless at cooperating and self-organizing to maintain law and order and promote development (especially of the long-term variety that requires high future time orientation, something that is also conspicuously lacking among Russians and Meds) then somebody else has to do it for them. For example, Nordic or Germanic foreigners. With the unfortunate exception of Hitler, they have had quite a good record of keeping Russia in line – see Rurik, or Catherine the Great, or Peter the Great (who though Russian was highly influenced by the Germans and the Dutch). They should also be preferably technocrats. Putin spent many years in the GDR, and though he is not a technocrat, he is highly intelligent and many of his circle are. It could be a lot worse. And, of course, the state should be a strong state. Much stronger than its peers in places like Copenhagen or Boston where social civility is largely maintained by society itself, as opposed to its armed and deputized organs. This is why Russians are quite right to view attacks on their state, including Western attempts to destabilize it, as attacks on their own society and for that matter on themselves. 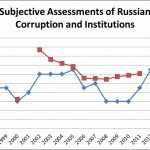 With the exception of their liberal fifth column, Russians are at least far-sighted enough to realize that.